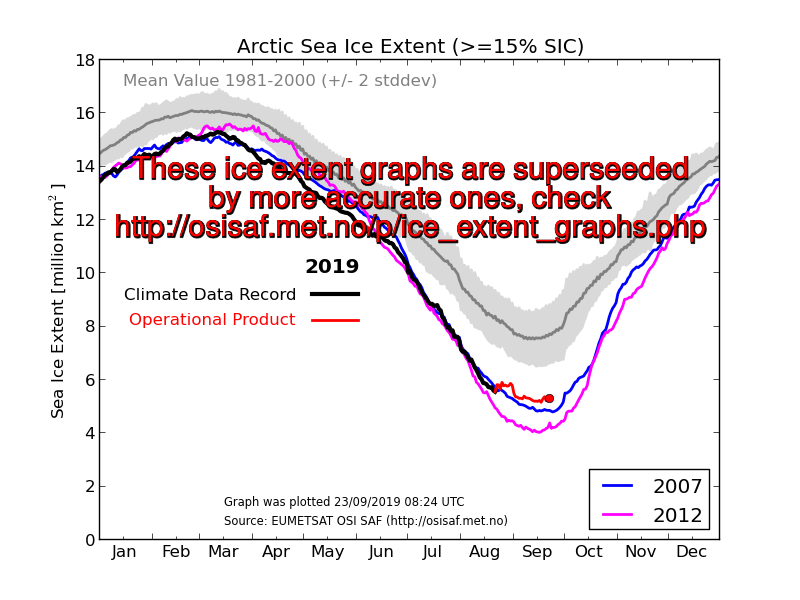 Monthly Northern Hemisphere Sea Ice Extent. 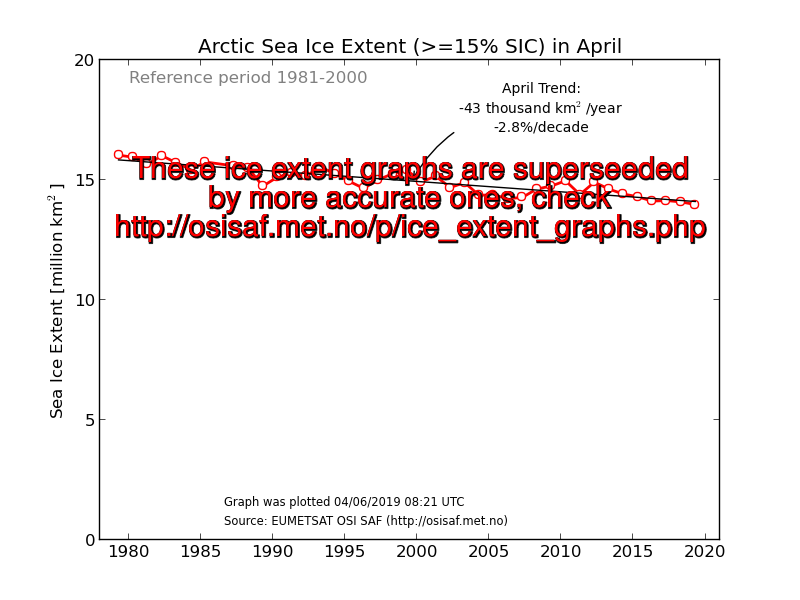 Sea Ice Extent (SIE) is defined as the area covered by sea ice, that is the area of ocean having more than 15% Sea Ice Concentration (SIC). Sea Ice Concentration is the fractional coverage of a grid cell that is covered with sea ice. At hemispherical scales, SIE is often reported with units of 10^6 sq km (millions square kilometers). The links above provide full documentation on the algorithms and processing details for these OSISAF products, as well as URLS to access the SIC data, and to visualize examples maps of the products. All our SIC products are based on passive microwave sensors. The CDR uses data from the SMMR, SSM/I, and SSMIS instruments, while the ICDR and NRT products are using SSMIS only. Atmospheric fields of wind speed, water vapour and 2m temperature are used as well, all from the ECMWF, both from re-analysis (ERA-40), and NRT services. Daily SIE values are computed from the daily Sea Ice Concentration maps. All sea ice covered ocean is included, lake ice is not. SIE is computed as the sum of the area of the grid cells that have a SIC value larger than 15%. This is valid for the 3 SIC datasets above. In the daily time series above, the CDR is always used from Oct 1978 to Apr 2015, then the ICDR onwards. The ICDR having a monthly delay, the last 30 days of the time series are always from the NRT SIC product. Validation experiments conducted at the OSISAF documented that the ICDR is a consistent extension of the CDR. This is expected since the two products use the same algorithms and processing chains. The NRT SIC product uses a slightly different land mask than the CDR and ICDR. In addition, some minor algorithm differences exist. Thus, the NRT SIC product cannot be used directly as a consistent continuation of ICDR, and its SIE values are corrected (by linear regression) to those of the ICDR. The daily values are plotted as-is, without interpolation nor running-mean average. The OSISAF Monthly SIE values are computed as averages of the daily SIE values. 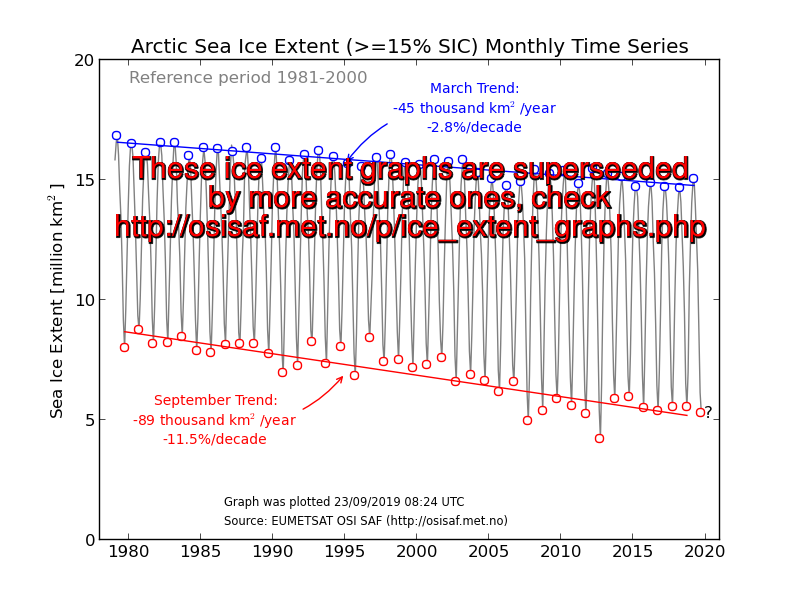 This is different from what is done for NSIDC's Sea Ice Index (SII) where montly SIE values are computed from monthly maps of SIC. Whenever daily SIE data are available from both the ICDR and the NRT SIC products for a given day, that from the ICDR is used, and that from the NRT product is discarded. The ICDR having a monthly delay, the last two months of the time series are continuously updated. Indeed,the current month is missing daily data (from NRT), and the previous month has daily data both from ICDR and NRT.The earlier month are more definitive, since it uses either only CDR or only ICDR. All the trends are from least-square linear regression, with no consideration for statistical correlations between the points along the time series. As for all trends, they describe the past changes, but should be used with caution when predicting future evolution. The linear rate of change in SIE is always indicated as thousands km per year, to be easily comparable with the values at the NSIDC SII. The same rate of change are also reported as percentage change per decade, relative to a base period. The base period is 1981-2000, again to ease comparison with NSIDC SII. 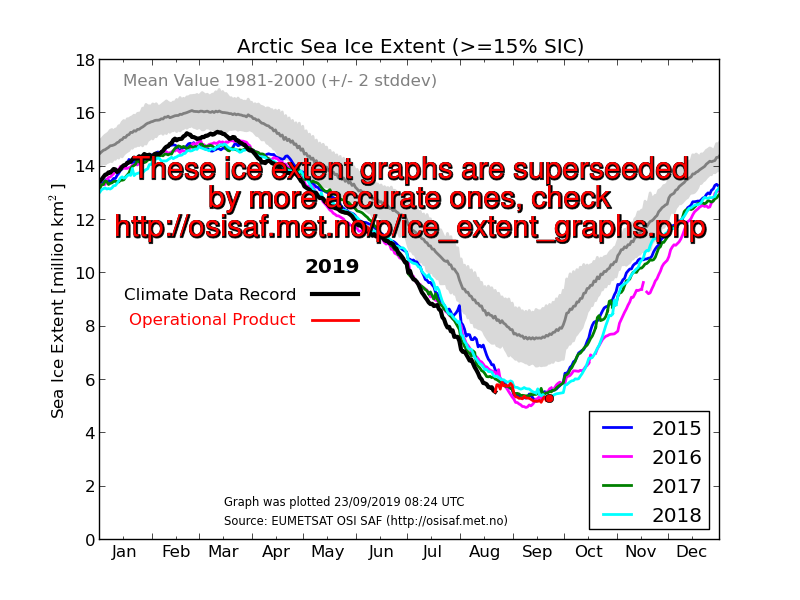 An earlier version of these graphs existed before spring 2016. The main difference was in the input data used. The NRT OSI-401-a product had many limitations for computation of consistent SIE data, among which the lackof correction for the land spill-over effects. As a consequence, the contribution of coastal SIE data was notcomputed directly but as time-dependent regressions to the CDR. The new version of the SIE data and plot uses OSI-401-b and the ICDR, which is much more consistent with CDR.